My wife makes hand-made cards and prints, and I was wondering what the legal implications would be if she used photos of LEGO in some of her designs, or if she made a calendar / flick book to sell at craft fairs and online? Anyone had any experience of this? Someone said LEGO have a book policy that they will send you upon request. It provides guidance on what they accept and do not accept. Has anyone got a copy? I believe you can contact Lego and ask. I do know that if you use Lego designs and prints in an item you are selling you could have issues. I would say when in doubt, contact Lego and ask for their Legal dept. Ive seen lego used in various settings like tv ads and music videos where they went out of their way to show the studs and specifically that they didnt say lego on them. Sad to say, but just build it with megablocks and youll be fine. 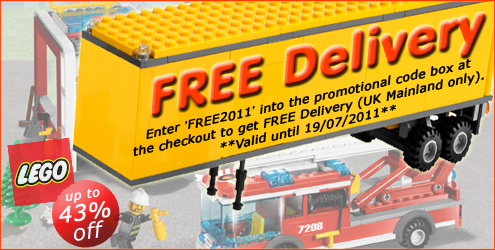 Lego dont like free advertising it seems. I think if you include the property of someone else's (in this case the property being a lego design) for your own financial gain, you need the permission of the owner. The context is important, so for instance, if you included lego in the background for a news feature no release is required. Whether they take legal action or not maybe more dependent on the financial loss to themselves. If it is small volume and local, they may not think it sufficient use of resources to take any action. A warning maybe issued requiring no further sales and maybe a loss to yourself if you've made lots of cards. Basically, LEGO is concerned whenever something appears to be officially endorsed by their company. So, as long as there's no way that ANYONE would construe it as a LEGO product, they're fine with it. 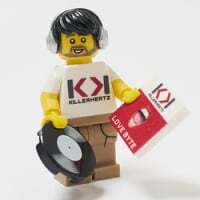 1) Avoid using any of their logos, unless it's clearly an image of a product they sell (like a picture of a person holding a LEGO set, for instance). Honestly, though? Just do what you want to do. Technically, they could come at you for almost ANYTHING if they felt like it. They've gone after MegaBloks (and mostly failed!) for using 2x4 bricks, which LEGO feels is one of their trademarks. So, yeah, they could TRY and take you to court for just about anything you do with LEGO, and it's up to the court to decide. But that's a waste of your time and theirs. In other words, the legality is unclear (it depends on what you do, which judge you get, and who the lawyers involved are), and they're not likely to even try to stop you unless you really go out of your way to make it look official, and are making them look bad and/or competing with them. If you use Lego element/bricks in a stylized, abstract or artistic way, you should be fine. Like 'davee' say's...stay away from logo's and showing actual models/boxes, etc. If you're photographing a brick close up and you can see the little Lego words clearly, photoshop them out. Stay along the stylized/artistic photograhic route and you'll be ok. Also keep your print runs low too. ^^ Surely that's allowed as they're actually selling Lego? I've seen all type of non-TLG lego products, eg. Earrings, jewellery, framed minifigs (classic, and custom). If you were mass producing/marketing them, then you may have an issue. But I can't see small scale craft fairs etc being an problem as long as you're not selling them under the lego brand or logo. Forgive me for bumping an old thread, but did you ever hear back from TLG @SparkyHam? I'm thinking strongly of opening a RedBubble account to try to sell some of my LEGO photography. There are quite a few people selling LEGO photos on the website (see @bluemoose's link above) and I'm wondering if they have all individually sought permission, or if it's okay to sell the photographs in an 'artistic' context as @legoDad suggests. Agree totally with LFT. I think selling stuff at craft fairs is (whilst still technically infringing copyright) going to be considered pretty innocuous - if it's only local crowds I wouldn't see that really being too big an issue and it's not like it's diverting money away from Lego or purporting itself to be an official LEGO product. Anything online is a LOT more visible to the omnipresent gaze of the Lego lawyers and I'd expect at some point a cease and desist notice to come along - am sure it happens loads everywhere but it probably is never a good thing to have a chance of the lawyers bearing down on you! The internet, and this thread, is full of bad advice on IP law. Most people online don't even seem to understand the basic differences between copyrights, patents, trademarks, and trade secrets. LEGO's "fair play" guide is their perspective on this issue. If they had their way it would be illegal to make compatible bricks at all. But the fact is that the patents on the basic brick are all expired, and the basic brick design is considered functional and therefore generally not covered by copyright or trademark. In other words, LEGO no longer has any exclusive IP rights to the basic brick and can't tell anyone what they can or can't do with it. Here's the most realistic advice you are going to get: assuming that you don't want to use LEGO's logo, your wife can go ahead and use photos of LEGO in her cards and prints. The absolute worst thing that would happen is you would get a letter from LEGO asking you to stop, and you could decide what to do at that time. (*) Footnote: There are many countries in the world and I can't say what the legal status of LEGO is in all of them. LEGO has no exclusive right to the basic brick in the European Union, Canada, or the United States. Even better, find a lawyer who actually does IP law, since law is so complex each one just does their own thing, don't ask a family lawyer about IP law for example. I was wondering this in terms of say I changed my profile pic to an official picture of lego, say a star wars or harry potter figure, is that allowed? Am assuming this is fine, but you never know these days. What about custom fig and weapons sellers on thebay, how do they get round it? I really wish eBay would start enforcing their own rules and get the non-LEGO items out of the LEGO categories. I'm tired of seeing "Enlighten" junk when I search for LEGO. If they claim their product is Lego, they're violating the law. If they claim it's Lego-compatible then they're not.